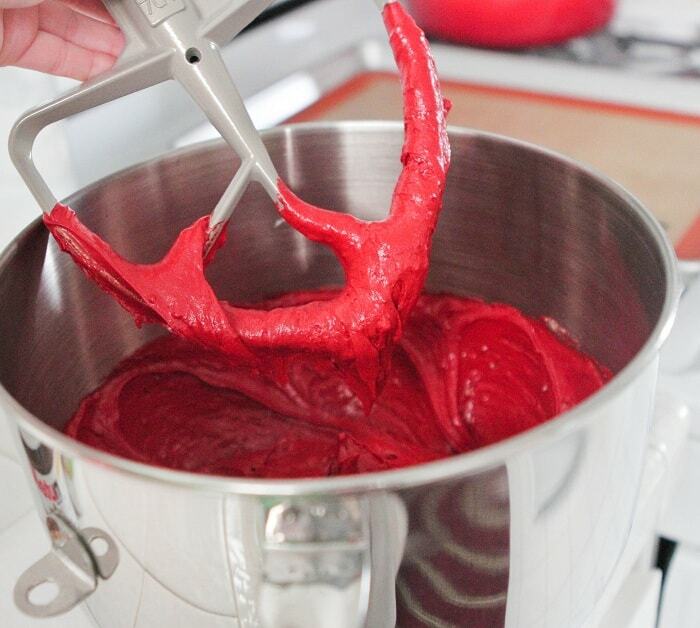 How fun is red velvet cake?! It really is so stunning. This jazzed up cake mix sheet cake is so simple to prepare you will have it on your table in no time at all. Did I mention that I iced it with a Nutella Fudge like icing? Let’s just say you are in for a treat today! I am loving my new red cake stand that I found from my friend Lindsey from high school. She makes them herself and they are adorable. Check out her blog Sweet Stax to pick some up for yourself! Here’s your line-up folks. Nice and easy. 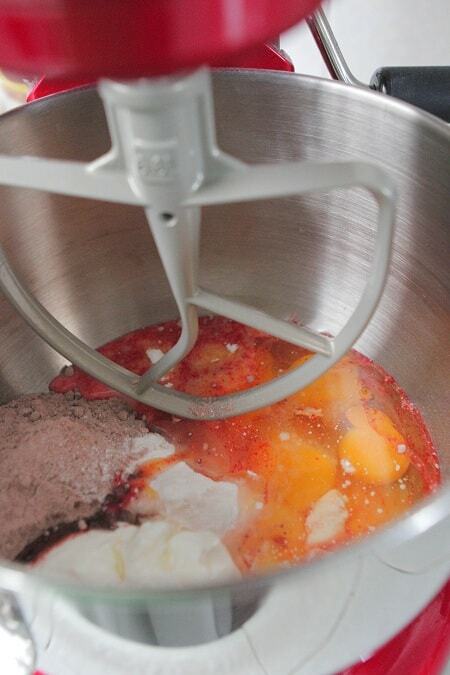 I love this recipe for so many reasons, but one is that you just dump it into the mixer. No particular order. 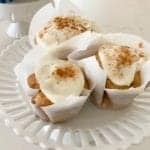 I add a small box of vanilla pudding mix. 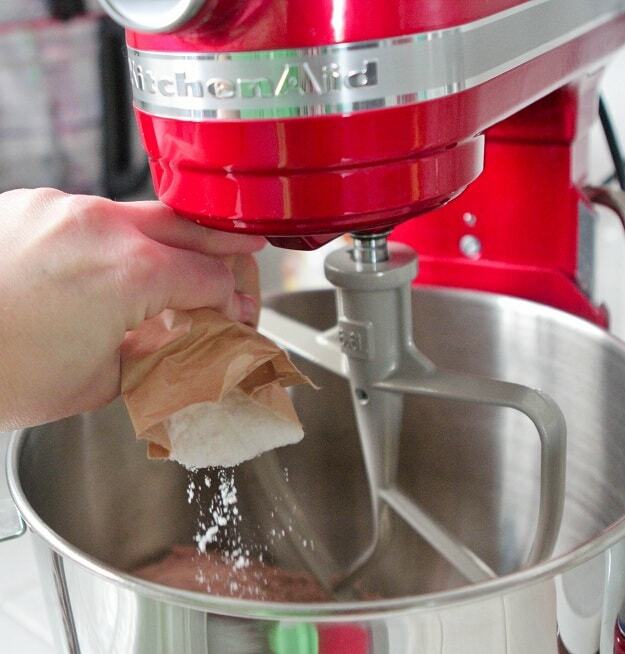 Add it right to the mixer. ….milk, sour cream and some oil. Give her a nice even spread. Baked! 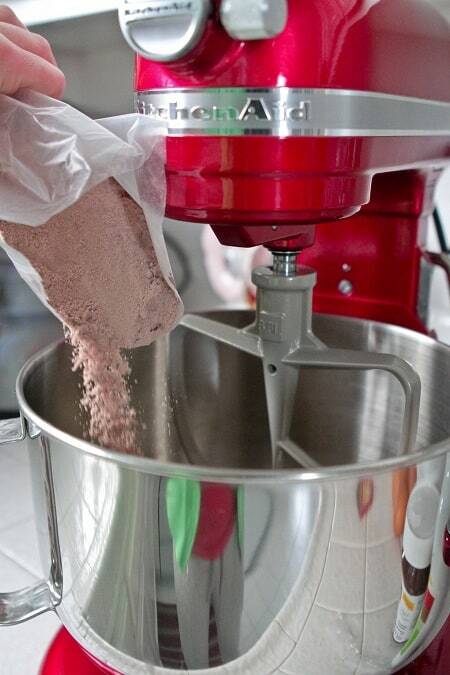 Now hurry, time to make the icing! 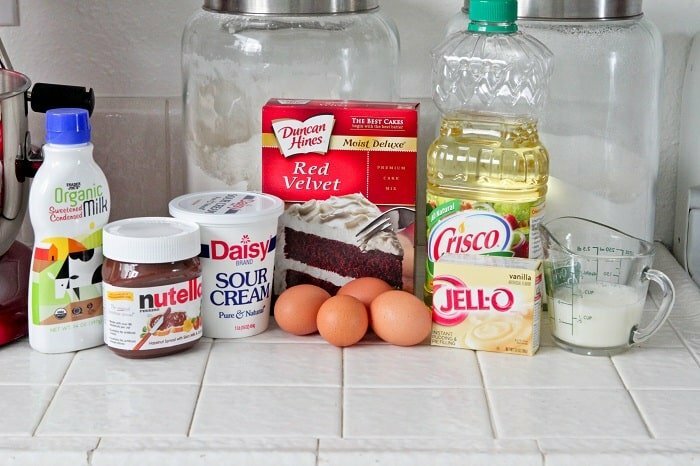 Your icing consists of Nutella and sweetened condensed milk. I doubled what you see here. Warm in the microwave and give a good mix. Time to drizzle over your warm cake. 1. 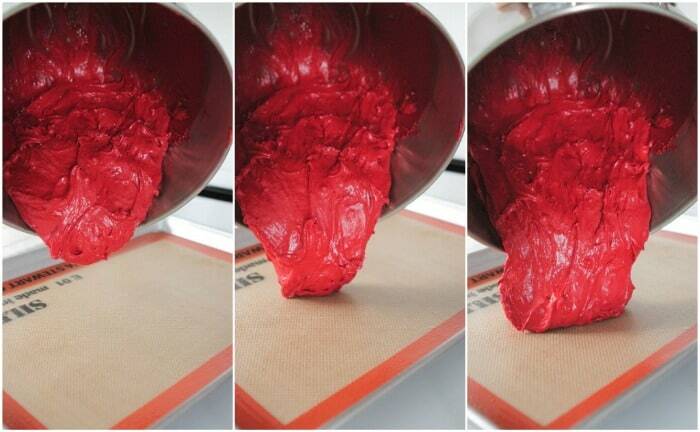 Preheat oven to 350 degrees F. and spray a half sheet 13×18 inch baking sheet with non-stick cooking spray. I lined my baking sheet with a silpat liner, the cake can be done with or without it. 2. 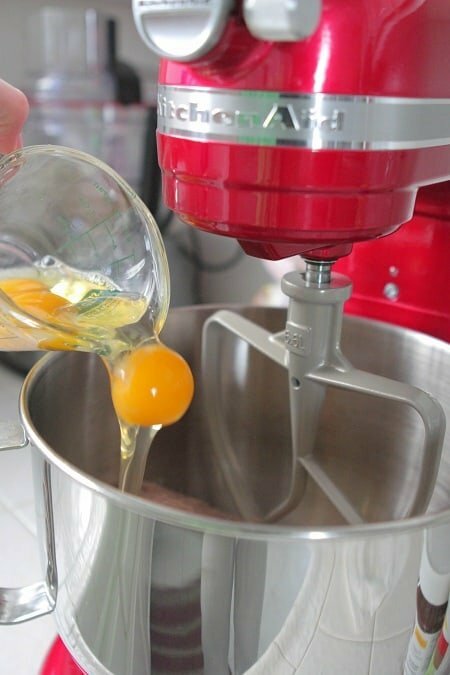 Place cake mix, pudding mix, milk, oil, sour cream and eggs into mixer and mix until well combined, about 1 1/2 minutes. Transfer batter to prepared baking sheet and spread evenly. Bake for 25-32 minutes, until baked through. 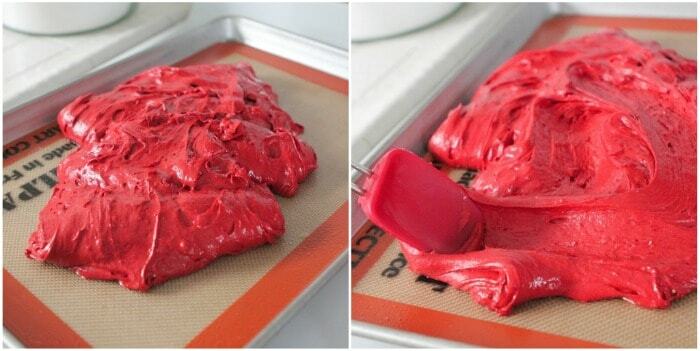 Remove from oven and start icing. 3. 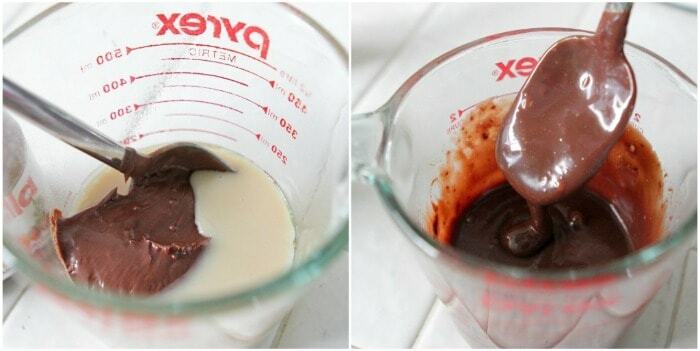 Place sweetened condensed milk and nutella into a microwave safe dish and heat for 30 seconds, or until smooth when stirred. Drizzle icing over warm cake spreading oven entire cake. Let cool for 20 minutes then cut into squares with a plastic knife. I love how you just warmed the Nutella in the microwave and poured. 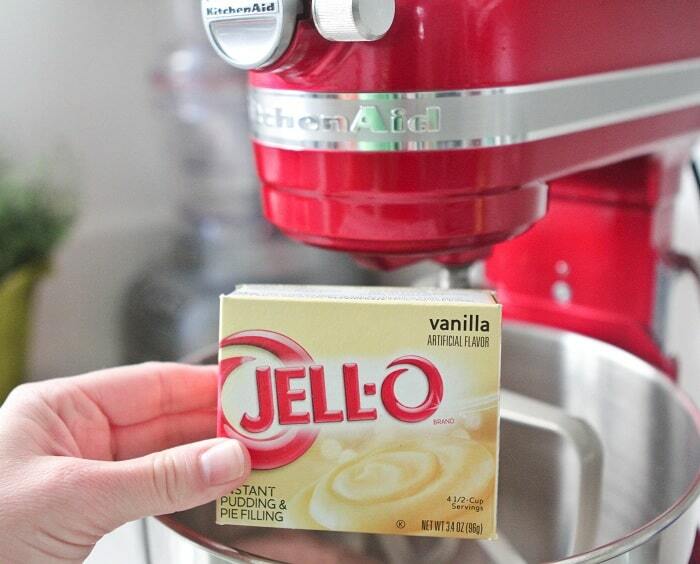 That’s my kind of frosting: EASY! And I love that it’s just dump in, in no particular order, and mix. Your recipes are always great for that! Wow, the colour is so perfect for valentines day! Yum!! I think this is one of the best red velvet’s I’ve seen ever, because of that Nutella icing. Looks so good! lol, me you and Lori all did Red Velvet today! This looks delicious Jenny!! I topped my crepes with Nutella too!! 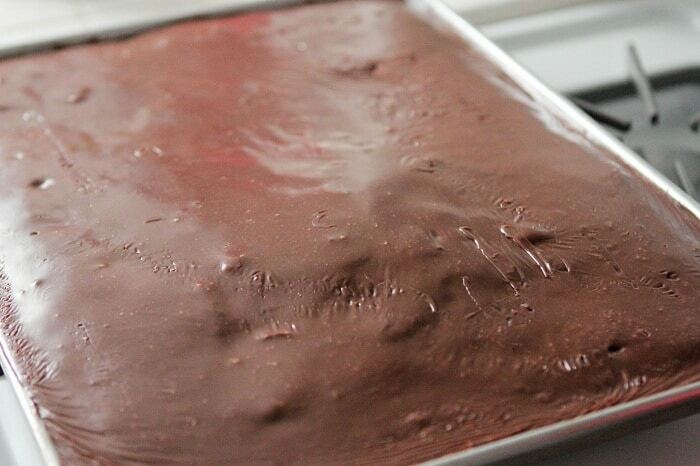 What a delicious idea for a sheet cake! So pretty! 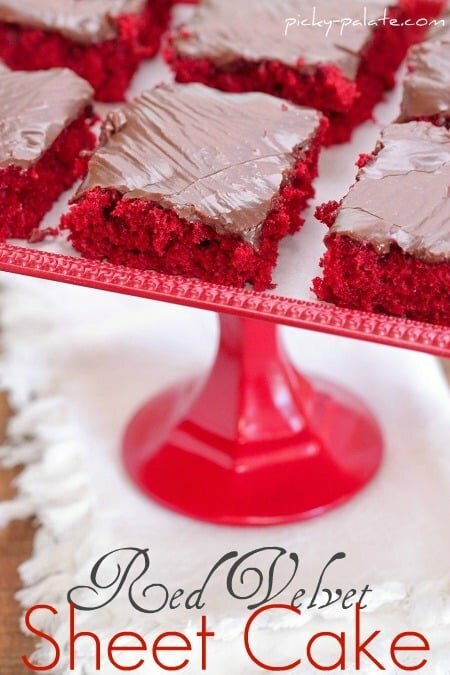 Such a fun sheet cake recipe! And that icing? Oh my! 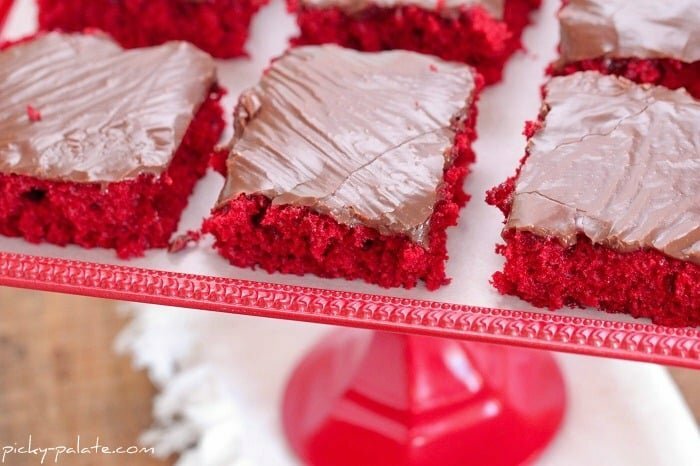 Love the combination of red velvet and nutella! I want to take a bath in that frosting. That isn’t creepy, is it? I love how vibrant that cake is, gorgeous! Aww, what a shame, I’ve got a vat of Nutella and sweetened condensed milk on hand. Would it be wrong to dip my hand in it and eat it that way? This is crazy gorgeous! Great combo of flavors. 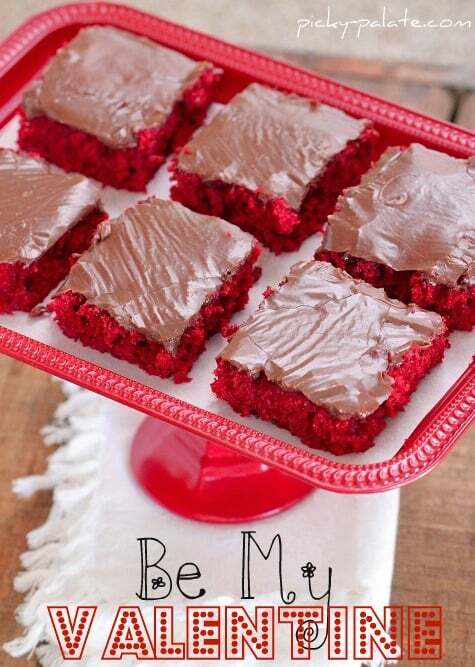 Oh yeah, I’m in love with that red cake stand! Will you be my Valentine Jenny?! I totally want to dive right into these! This looks so so incredible!! I’m seriously craving this now! Looks amazing. Who would have thought of nutella and sweetened condensed milk icing. Wow. When you pour the icing on it looks thin, but the frosting seems to have thickened up. Lovely! Hey Jenny! I love your blog, and EVERYTHING I’ve ever made has turned out wonderfully – and I’ve made a ton! =) Quick question, I’ve never used a silpat liner – do you still have to grease/spray it? Thank you! Oh, so heavenly! I’m trying this one for sure! my 2 fave things in life…red velvet cake + nutella…LOVE!!! Wow. Looks delicious! 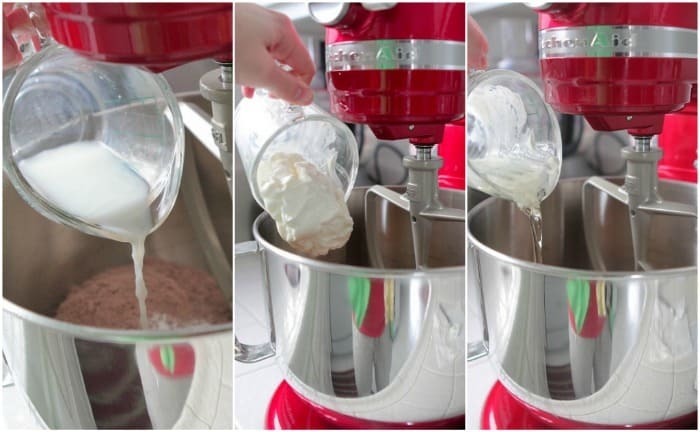 How does the frosting set-up? Does it stay soft or firm up? I don’t even particularly like boxed cake mixes, but time after time you tempt me to try out your concoctions (oops, creations) and, you know, they’re not half bad! Beautiful cake! 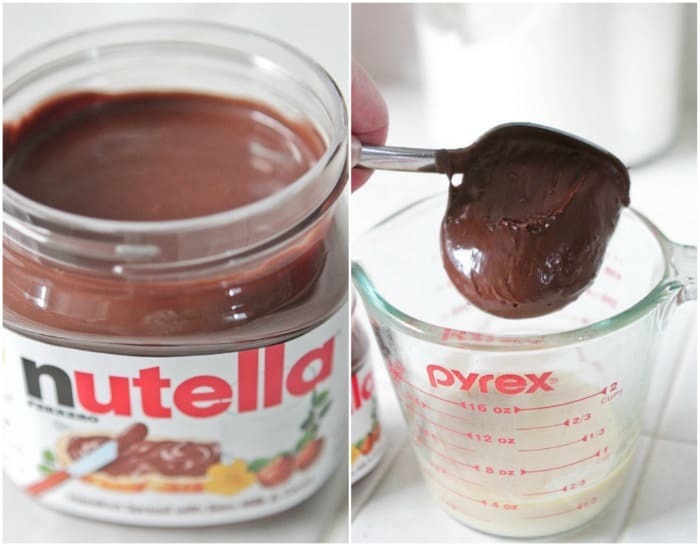 And a nutella icing, omg!! Perfect Valentine’s day treat!! 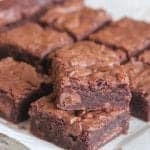 Jenny, I was wondering if I would have to alter the recipe if I used a 9×13 baking pan? This looks so delicious! Funny, cause I just made a chocolate texas sheet cake for my daughters birthday last night. 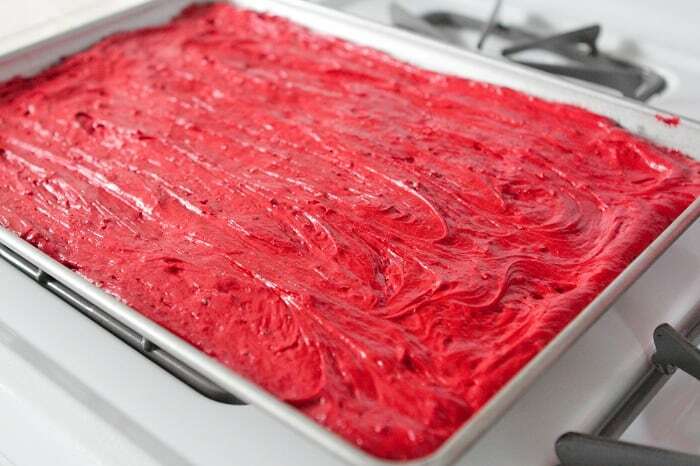 This red velvet one looks wonderful! I LOVE it when frosting gets that crackly look. It makes me drool! YUM!! That looks like nothing but pure heaven. And here I was looking all forward to treating myself to a Skinny Cow ice cream … now methinks I need to run to the store for supplies! Even if you don’t I totally understand! Another blogger started this and it would be cool to see how far it goes, plus it helps out fellow bloggers. Thank you so much for the award Savannah! Have a great day!! I made this delicious cake today! The icing, perfectly sweet, the cake rich and moist. YUM! 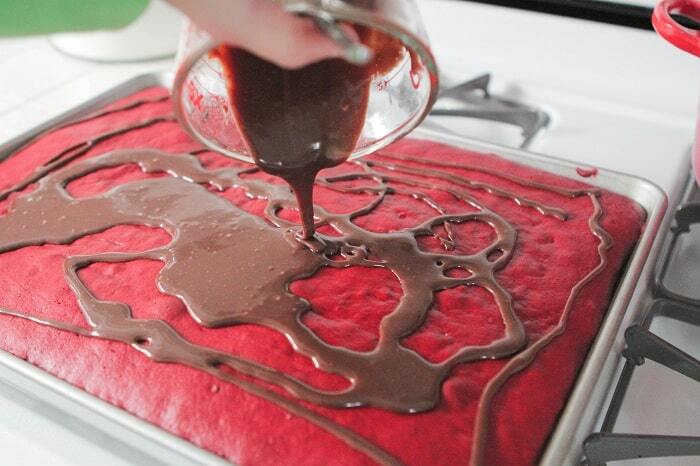 red velvet cake + nutella=ingenious. Yummy! I know red velvet seems to be getting some backlash lately but I don’t get it. This looks ridiculously good, Jenny! And the red colour is stunning! Now if only I saw this when it was posted I could have been there eating it by now. Love it. Just made this today! It’s going to be a great ending to my Valentine’s dinner tonight!! I made this last weekend but didn’t have Nutella so I used Biscoff spread instead for the icing. It turned out great! Made for Valentines Day and it was a huge hit! Fabulous! This cake is amazing! I just made this last night but substituted applesauce for the oil and greek yogurt instead of sour cream. It only took 18 minutes to bake. WOW! I don’t ever like red velvet but these are making my mouth water. What a creative combination!